Blondie and Brownie: The 2010 Vendy Noms Are Out! and last year’s “Rookie of the Year” Vendy Award winner Schnitzel & Things is back in the mix this time competing for the Vendy's Cup along with El Rey del Sabor, The Bistro Truck, Freddie “The Falafel King” of Astoria, and the Patacon Pisao truck. You can "meet" all the finalists in some fantastic videos on Food Curated. Here's the drill...the big day is September 25th from 12pm to 5pm on Governors Island (!). Tix are $85 and the money goes to benefit the Street Vendor Project and a portion of the ticket is tax deductible. For the price of your ticket you get an open bar of wine, beer and soda and all you can eat from the five finalists. Plus you get to cast your vote for the People's Choice Award. If you need a reminder about how excellent the Vendy's are, check out our coverage from 2008 (part 1 and part 2)and 2009. The Vendy's always sell out, so what are you waiting for? Get your tickets now! 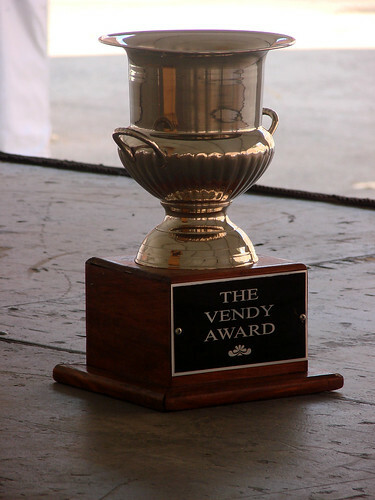 And keep track of all the Vendy news via @vendyawards.